The adrenal cortex comprises three main zones, or layers. This anatomic zonation can be appreciated at the microscopic level, where each zone can be recognized and distinguished from one another based on structural and anatomic characteristics. The adrenal cortex exhibits functional zonation as well: by virtue of the characteristic enzymes present in each zone, the zones produce and secrete distinct hormones. The outermost layer, the zona glomerulosa is the main site for production of aldosterone, a mineralocorticoid, by the action of the enzyme aldosterone synthase (also known as CYP11B2). Aldosterone is largely responsible for the long-term regulation of blood pressure. Aldosterone's effects are on the distal convoluted tubule and collecting duct of the kidney where it causes increased reabsorption of sodium and increased excretion of both potassium (by principal cells) and hydrogen ions (by intercalated cells of the collecting duct). Sodium retention is also a response of the distal colon, and sweat glands to aldosterone receptor stimulation. Although sustained production of aldosterone requires persistent calcium entry through low-voltage activated Ca2+ channels, isolated zona glomerulosa cells are considered nonexcitable, with recorded membrane voltages that are too hyperpolarized to permit Ca2+ channels entry. However, mouse zona glomerulosa cells within adrenal slices spontaneously generate membrane potential oscillations of low periodicity; this innate electrical excitability of zona glomerulosa cells provides a platform for the production of a recurrent Ca2+ channels signal that can be controlled by angiotensin II and extracellular potassium, the 2 major regulators of aldosterone production. Angiotensin II originates from plasmatic angiotensin I after the conversion of angiotensinogen by renin produced by the juxtaglomerular cells of the kidney. The expression of neuron-specific proteins in the zona glomerulosa cells of human adrenocortical tissues has been predicted and reported by several authors and it was suggested that the expression of proteins like the neuronal cell adhesion molecule (NCAM) in the cells of the zona glomerulosa reflects the regenerative feature of these cells, which would lose NCAM immunoreactivity after moving to the zona fasciculata. However, together with other data on neuroendocrine properties of zona glomerulosa cells, NCAM expression may reflect a neuroendocrine differentiation of these cells. 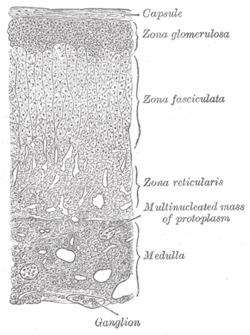 Situated between the glomerulosa and reticularis, the zona fasciculata is responsible for producing glucocorticoids, such as 11-deoxycorticosterone, corticosterone, and cortisol in humans. Cortisol is the main glucocorticoid under normal conditions and its actions include mobilization of fats, proteins, and carbohydrates, but it does not increase under starvation conditions. Additionally, cortisol enhances the activity of other hormones including glucagon and catecholamines. The zona fasciculata secretes a basal level of cortisol but can also produce bursts of the hormone in response to adrenocorticotropic hormone (ACTH) from the anterior pituitary. 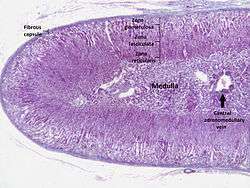 The inner most cortical layer, the zona reticularis produces androgens, mainly dehydroepiandrosterone (DHEA), DHEA sulfate (DHEA-S), and androstenedione (the precursor to testosterone) in humans. The upper (multi-colored) adrenocortical steroid pathway illustration at right has an error. It is not aromatase which converts estrone to estradiol, it is 17-hydroxysteroid dehydrogenase (see adjacent, parallel, orange pathway) which converts estrone to estradiol. If somebody knows how to get this fixed, please do so. The adrenal cortex produces a number of different corticosteroid hormones. The primary mineralocorticoid, aldosterone, is produced in the adrenocortical zona glomerulosa by the action of the enzyme aldosterone synthase (also known as CYP11B2). Aldosterone is largely responsible for the long-term regulation of blood pressure. Aldosterone effects on the distal convoluted tubule and collecting duct of the kidney where it causes increased reabsorption of sodium and increased excretion of both potassium (by principal cells) and hydrogen ions (by intercalated cells of the collecting duct). Sodium retention is also a response of the distal colon, and sweat glands to aldosterone receptor stimulation. Although sustained production of aldosterone requires persistent calcium entry through low-voltage activated Ca2+ channels, isolated zona glomerulosa cells are considered nonexcitable, with recorded membrane voltages that are too hyperpolarized to permit Ca2+ channels entry. However, mouse zona glomerulosa cells within adrenal slices spontaneously generate membrane potential oscillations of low periodicity; this innate electrical excitability of zona glomerulosa cells provides a platform for the production of a recurrent Ca2+ channels signal that can be controlled by angiotensin II and extracellular potassium, the 2 major regulators of aldosterone production. Angiotensin II originates from plasmatic angiotensin I after the conversion of angiotensinogen by renin produced by the juxtaglomerular cells of the kidney. Dehydroepiandrosterone (DHEA): It is the primary precursor of natural estrogens. DHEA is also called dehydroisoandrosterone or dehydroandrosterone. The reticularis also produces DHEA-sulfate due to the actions of a sulfotransferase, SULT2A1. ↑ "Embryology of the adrenal gland". Retrieved 2007-12-11. ↑ Anatomy Atlases - Microscopic Anatomy, plate 15.292 - "Adrenal Gland"
1 2 3 4 Ehrhart-Bornstein M, Hilbers U (1998). "Neuroendocrine properties of adrenocortical cells". Horm. Metab. Res. 30 (6–7): 436–9. doi:10.1055/s-2007-978911. PMID 9694576. 1 2 Whitehead, Saffron A.; Nussey, Stephen (2001). Endocrinology: an integrated approach. Oxford: BIOS. p. 122. ISBN 1-85996-252-1. 1 2 Curnow KM, Tusie-Luna MT, Pascoe L, et al. (October 1991). "The product of the CYP11B2 gene is required for aldosterone biosynthesis in the human adrenal cortex". Mol. Endocrinol. 5 (10): 1513–22. doi:10.1210/mend-5-10-1513. PMID 1775135. 1 2 Zhou M, Gomez-Sanchez CE (July 1993). "Cloning and expression of a rat cytochrome P-450 11 beta-hydroxylase/aldosterone synthase (CYP11B2) cDNA variant". Biochem. Biophys. Res. Commun. 194 (1): 112–7. doi:10.1006/bbrc.1993.1792. PMID 8333830. 1 2 3 4 Hu C, Rusin CG, Tan Z, Guagliardo NA, Barrett PQ (June 2012). "Zona glomerulosa cells of the mouse adrenal cortex are intrinsic electrical oscillators". J. Clin. Invest. 122 (6): 2046–53. doi:10.1172/JCI61996. PMID 22546854. 1 2 3 4 Dunn R. B.; Kudrath W.; Passo S.S.; Wilson L.B. (2011). "10". Kaplan USMLE Step 1 Physiology Lecture Notes. pp. 263–289. ↑ Lefebvre H, Cartier D, Duparc C, et al. (March 2002). "Characterization of serotonin(4) receptors in adrenocortical aldosterone-producing adenomas: in vivo and in vitro studies". J. Clin. Endocrinol. Metab. 87 (3): 1211–6. doi:10.1210/jcem.87.3.8327. PMID 11889190. ↑ Ye P, Mariniello B, Mantero F, Shibata H, Rainey WE (October 2007). "G-protein-coupled receptors in aldosterone-producing adenomas: a potential cause of hyperaldosteronism". J. Endocrinol. 195 (1): 39–48. doi:10.1677/JOE-07-0037. PMID 17911395. ↑ Haidan A, Bornstein SR, Glasow A, Uhlmann K, Lübke C, Ehrhart-Bornstein M (February 1998). "Basal steroidogenic activity of adrenocortical cells is increased 10-fold by coculture with chromaffin cells". Endocrinology. 139 (2): 772–80. doi:10.1210/endo.139.2.5740. PMID 9449652. ↑ Rainey WE, Nakamura Y (February 2008). "Regulation of the adrenal androgen biosynthesis". J. Steroid Biochem. Mol. Biol. 108 (3–5): 281–6. doi:10.1016/j.jsbmb.2007.09.015. PMC 2699571 . PMID 17945481. Anatomy photo:40:04-0203 at the SUNY Downstate Medical Center - "Posterior Abdominal Wall: Blood Supply to the Suprarenal Glands"